Rhodiola rosea, more commonly known as golden root or rose root, is a perennial flower indigenous to many cold regions of the world; including the Arctic, Central Asia, and mountainous areas in Europe. It has been used in traditional Chinese medicine, through which it has been touted for its potential to support cognitive function and promote energy. Research reveals that there are two primary compounds that may contribute to Rhodiola rosea’s possible effects: salidroside and rosavins. We identify the percentage of rosavins or salidroside to help you determine how powerful the extract should be. Let’s take a closer look at these compounds, and their role in the rhodiola rosea root. Rosavins are a collection of compounds which include, rosavin, rosin and rosarin. They are known as a cinnamyl alcohol glycoside belonging to a group of compounds known as phenylpropanoids. They are amongst the main active phytochemical components in Rhodiola rosea, but studies remain inconclusive on how they specifically operate and their mechanisms of action. Some research suggests that rosavins may not be effective on their own, but must be combined with other more powerful compounds, like salidroside, to exhibit potential effects. Research suggests that rosavin in Rhodiola rosea may support healthy stress levels. Rosavin may also act as an active compound that supports weight loss. Studies show that rosavin may potentiate hormone-based lipase, an enzyme that can break down adipose tissue, or fat, particularly around the midsection. This break down of stomach fat may be increased when rosavin is combined with exercise. Alternately known as rhodioloside, salidroside is considered the more powerful component in Rhodiola rosea . Some studies even suggest salidroside may be more active than rosavin. Salidroside is a glucoside form of tyrosol and can be found in Rhodiola crenulata, a species related to Rhodiola rosea found specifically in China. Salidrosides have also been found in other unrelated plants species. Research identifies that salidroside may have a variety of positive effects throughout your body. Some studies show that salidroside may have adaptogenic properties. Adaptogens refer to any compound that may help your body adapt to the physical drawbacks associated with stress as well as maintaining homeostasis. Salidroside may also support nerve health. Studies suggest that salidroside may promote nerve repair processes, regulate the release of neurotransmitters, and protect cells. One study found that salidroside may protect nerve cells from toxins and other harmful substances while promoting cognitive function. Salidroside has also been found to potentially support skeletal health as well. A study tested the effects of an isolated salidroside extract on bone. The study found that salidroside may protect against oxidative stress. This suggests that salidroside may support bone development. 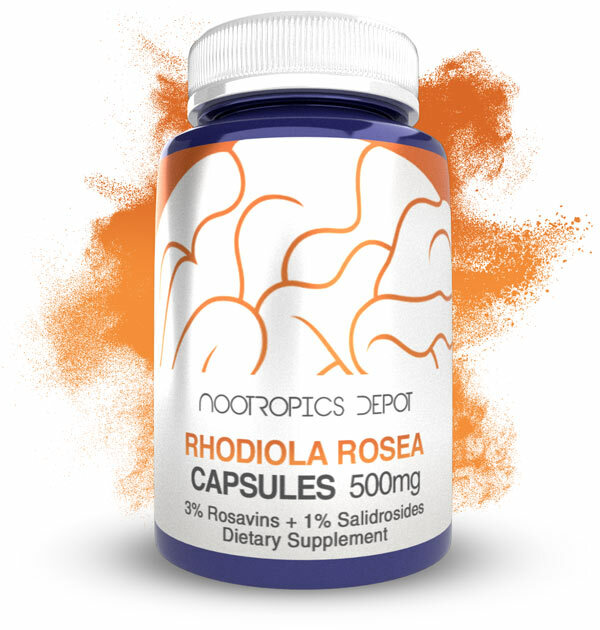 Many of the studies surrounding Rhodiola rosea focus on the nootropic as a whole, and the way its different phytochemicals and compounds, including rosavin and salidroside, work together. Studies show that one of the main mechanisms of action for Rhodiola rosea extract may involve its inhibition of monoamine oxidase. Monoamine oxidase comprises a family of enzymes bound to the outer membrane of mitochondria. The various subtypes of monoamine oxidase are all involved in the oxidative breakdown of various components and neurotransmitters in your system, including dopamine, norepinephrine, and serotonin. By blocking monamine oxidase enzymes, Rhodiola rosea may potentially lead to a significant increase in certain neurotransmitters, particularly serotonin and dopamine. Along with contributing to the body’s natural cyclic processes, serotonin is responsible for regulating emotions, especially happiness. Dopamine is responsible for a variety of functions, including movement and emotional response, but it is best known for controlling motivation, reward, and the brain’s pleasure centers. By potentially increasing both dopamine and serotonin, Rhodiola rosea may support healthy stress levels and promote feelings of well-being. The increased serotonin and dopamine may also support your attention, concentration, and overall cognitive function. Rhodiol rosea may also promote focus and mental energy. Along with its effects on certain neurotransmitters, Rhodiola rosea has been studied for its potential to regulate cortisol. Cortisol is released during periods of physical or emotional stress. Cortisol may interfere with a healthy immune system and the normal metabolism of fats, carbohydrates, and proteins, Rhodiola rosea may support healthy cortisol and stress levels. These adaptogenic benefits of Rhodiola rosea may also support a healthy night's sleep, which offers its own wide range of potential benefits such as promoting cognitive function. While many studies suggest that salidroside is the more powerful Rhodiola rosea supplement, both salidroside and rosavins play a key role in the potential effects of Rhodiola rosea extract. There appear to be about 60-90 species of rhodiola. The main rhodiola species of interest is rhodiola rosea as it contains both high concentrations of salidroside and rosavins. However, rhodiola rosea is in short supply these days and thus different species are being falsely sold as rhodiola rosea. Due to the fact that we perform species testing on all of our plant extracts, we discovered that one particular batch of “rhodiola rosea”, that was sent to us contained lots of salidroside, no rosavins, and the HP-TLC species testing indicated it was not rhodiola rosea. This made us scratch our heads quite a bit. How could one of the compounds of interest be showing up, while the other compound of interest was not at all present, in addition to it not even being the plant we were looking for? We dug through some research and found another fairly common species of rhodiola that has also seen extensive use in traditional medicine in China and Tibet. This species is called rhodiola crenulata, and it doesn’t contain any rosavins. Instead it contains high concentrations of salidroside and p-tyrosol, the stimulating and mood elevating compounds that are also present in rhodiola rosea. We retested the batch of “rhodiola rosea” that was sent to us, and discovered that we had actually been sent rhodiola crenulata. We then evaluated whether or not rhodiola crenulata would be a worthwhile extract and we quickly came to the conclusion that it could be advantageous to carry a rhodiola crenulata extract in addition to a rhodiola rosea extract. The reason for this being, that there is a potential that the supply of rhodiola crenulata would be more reliable and steady. In addition to this, the absolute lack of rosavins, makes this extract much better for individuals who respond particularly well to just salidroside. The extract will be better suited to atheletes looking to curb exercise fatigue and for individuals wanting just an energy boost. For those that are looking for a more well rounded effect profile, the rhodiola rosea will still be the preferred extract due to it containing rosavins. Click here to browse all of Nootropics Depot Rhodiola Rosea supplements and Rhodiola crenulata supplements.